Your donation brings HOPE to people who are hungry, right here in your own community. All contributions to the Mission of Hope qualify as a charitable contribution for tax purposes. We accept gently used clothing, household items, gently used furniture, baby diapers, personal hygiene items and non-perishable foods. Donations are accepted by drop box located outside of the Mission. For larger items, the Mission of Hope is open Wednesdays 8:00 am until 11:00 am. Your gift of $6 Feeds 1 Family for 1 month. Your gift of $13 Feeds 2 Families for 1 month. Your gift of $26 Feeds 4 Families for 1 month. Your gift of $33 Feeds 5 Families for 1 month. Your gift of $52 Feeds 8 Families for 1 month. Your gift of $65 Feeds 10 Families for 1 month. Your gift of $78 Feeds 12 Families for 1 month. Your gift of $98 Feeds 15 Families for 1 month. Your gift of $195 Feeds 30 Families for 1 month. Please donate to give HOPE to families during our annual Events and Holidays. 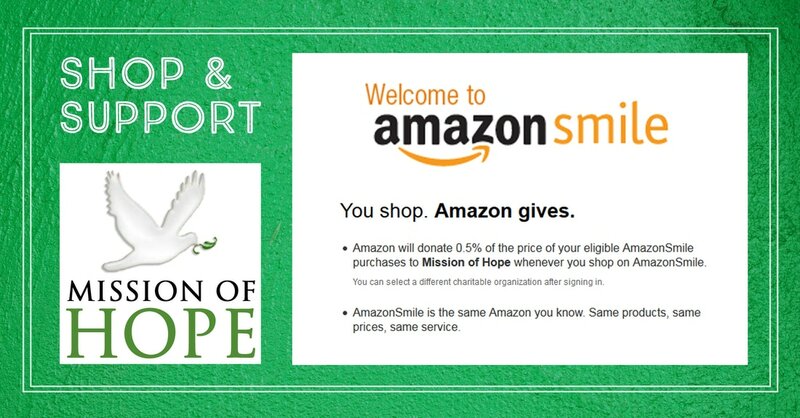 When you SHOP, Amazon gives to the Mission of Hope.